We are starting a new era in MuAlpha with a new Editor for the web news. Check back soon to see the site updated — sorry for the delay. Pictured above is Sister Jayne Montgomery receiving the 2016 Peterkin Award from committee chair Brother Glen Traquair. To see this content you must login using your MuAlpha login and password. If you have forgotten your login or password, you can reset your password and obtain your login info by clicking on [forgot?]. A message will be sent to the email MuAlpha has on file! --- Please keep your records up to date! 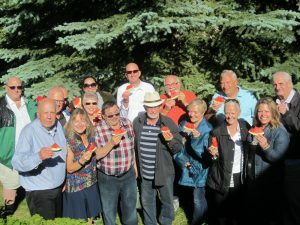 Please login to view more pictures of the MuAlpha Social jointly hosted by Brothers Robert Eklund & Mike Townsend at the Eklund's Residence in Calgary, Alberta on June 11, 2016. 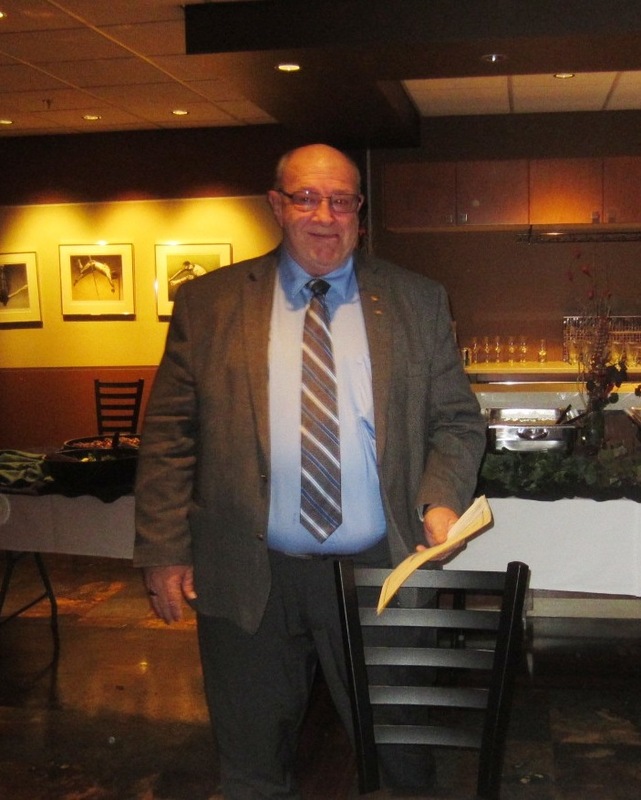 On Music Monday May 2, 2016 Harry Pinchin was inducted into the PhiBetaMu-MuAlpha Hall of Fame. The presentation was made by MuAlpha Board Member and PhiBetaMu International Past President Sheryl Bowhay during the New Edmonton Wind Sinfonia concert, “Invitation to the Dance”. Many of the MuAlpha “old guard” were in attendance: HARRY PINCHIN, Barry Valleau, Frank Dunnigan, Larry Schrum, Rita Burns, Tommy Banks, Armand Baril, Mike Achtymichuk, Neil Corlett, Joyce Houdle, Rob Speers, Roy Townend, Ray Baril, Duke Pier, Darwin Krips, Roberta Baril, Doug Zimmerman. 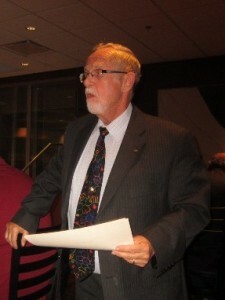 Please read more about Harry Pinchin and the presentation of the Hall Of Fame award on page 5 of the May/Spring edition of the PhiBetaMu International Newsletter which can be found on the PhiBetaMu International Website at www.phibetamu.org and click on Newsletter. 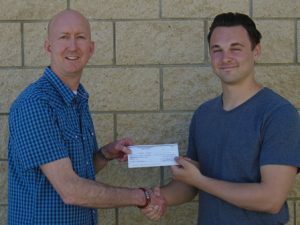 2016 MuAlpha National Youth Band Scholarship recipient Jarett Jacobs (right) is presented with a cheque for $300 by MuAlpha Secretary Kirk Wassmer (left). Jarett plays TUBA and is in his second year of the Bachelor of Music Program at the University of Lethbridge. Jarett plays in the University of Lethbridge Wind Orchestra, as well a brass quintet, a low brass ensemble, a university brass choir, and a community brass choir. Jarett Jacobs is an alumni of the Didsbury High School Band Program under the direction of Brother Kirk Wassmer. Pictured above (left) is Brother Glen Traquair, the recipient of the 2015 MuAlpha Peterkin Award. 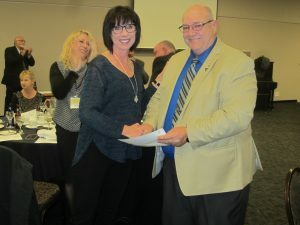 The award was presented by Awards Chairman, Brother Barry Valleau (right) during the MuAlpha AGM held in conjunction with the Alberta Music Conference at the Red Deer College Cornerstone on October 23. 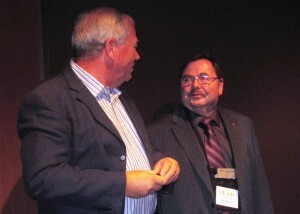 Past Past President Brother Earl Paddock (left) presents Past President Brother Steve Sherman with the Past President’s Pin during the MuAlpha AGM held in conjunction with the Alberta Music Conference at the Red Deer College Cornerstone on October 23. 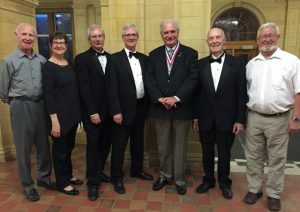 Phi Beta Mu – Mu Alpha Chapter provides an annual scholarship in the amount of $300 to an Alberta student that has applied to and been accepted into the National Youth Band of Canada. All accepted Alberta students are candidates for the Phi Beta Mu Scholarship. Interested students may apply directly to the Secretary of Phi Beta Mu – Mu Alpha Chapter at <http://www.privatedaddy.com/?q=B1chQ3RvMHx7dQQAVhpsE0NHVE42Rw-3D-3D_360> .